I’ve had a few questions on using the search function on Right Side Of The Chart. There are actually two separate options (ticker/tag function & the search bar) with various sub-options on the search bar. 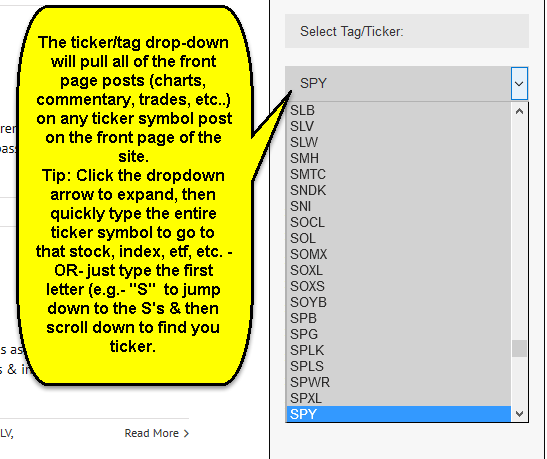 The “Select Ticker/Tag” drop-down menu located on the home page right sidebar is used to quickly reference all front page posts, commentary, charts, current & past trade ideas, etc… that were associated with any given stock, etf, index, sector, etc… The ticker “tags” are not associated with the posts & commentary made within the trading room, only the front page posts that I have published. Symbol tags also appear at the bottom of each post & can be clicked to view all past posts that contained that ticker symbol. 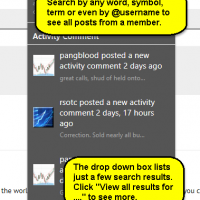 The search function, located on both the navigation menu bar at the top of the site as well as at the top of the trading room, functions similar to a web search, instead searching for any instances of that word that is entered within both the front page posts as well as the trading room & even messages within your own personal inbox. 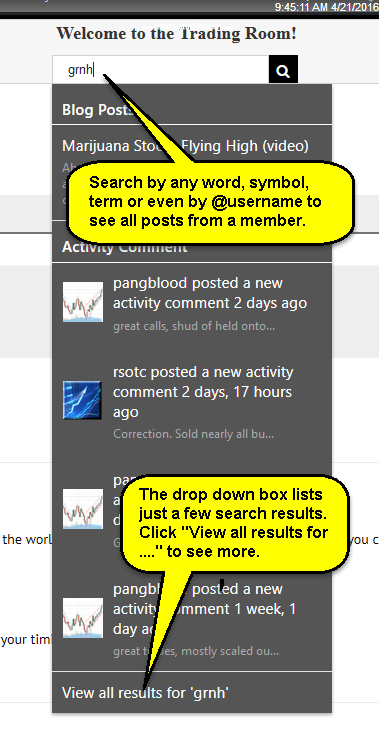 Additional, you can use the search function to find posts & commentary from other members by searching for their username (e.g.- @username or @rsotc). As with web searches, the search function on the site is not case sensitive although I am looking into adding that functionality in order to help facilitate search for references to stocks & etfs within the trading room, as the ticker symbols are often typed in upper-case to stand out. When you start typing in the search bar, auto-suggestions will begin to populate below, similar to a Google search. However, the suggestions will be grouped by type (blog, activity, etc..) & also limited to only a few results. Once you have entered the term or ticker symbol that you wish to find, go to the bottom of the drop-down menu & click on “View all search results for …”. 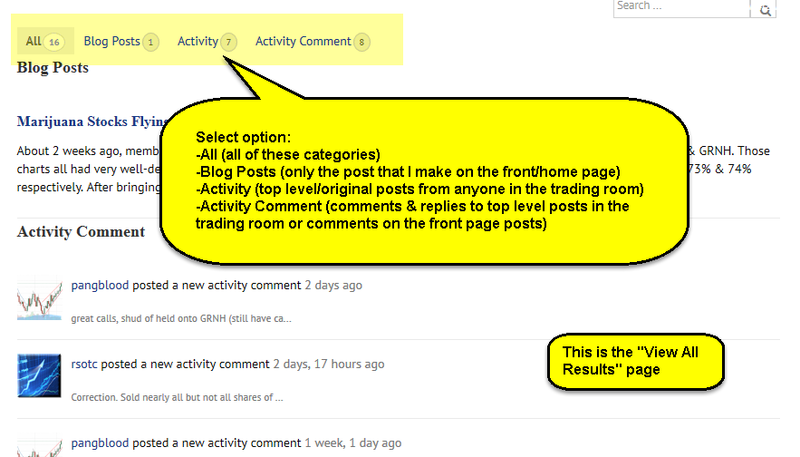 That will open a new page with expanded results which can be sorted by their source: All, Blog Posts (front page post that I have made), Activity (trading room top level posts), and Activity Comments (comments & replies to top-level or initial posts within the trading room). Click on the images above for a visual overview.